The First NSRC ended a few days ago after two and a half days packed with presentations, ranging from vehicles to researchers, from small companies to NASA. I learned a lot about the benefits, possibilities and options of suborbital research. On a personal level I have new respect for what is seemingly a step backwards from orbital flights and I want to be involved in any way I can. There are several vendors which over the next few years will compete for the attention of the research and education market (REM) for faster recycle time, purity of micro-gravity and payload options. The newly forming direction of NASA,marks in some ways a return to concepts and ways of NASA precursor, NACA, as stated by Simon (Pete) Worden, NASA Ames Center Director during the keynote of NSRC. Even NASA shares the suborbital vision of much cheaper research which is in many cases unique and in other cases relevant to deep space travel. The first day of NSRC mostly entailed presentations by the companies who will produce and launch suborbital vehicles useful for scientific experiments as well as suborbital tourism. The most publicly known vehicle, by nature of its parent company catering to space tourists more than space researchers, is SpaceShipTwo by Virgin Galactic. Stephen Attenborough, commercial director for the Richard Branson's very outspoken company emphasized the viability of the space tourism business (reportedly more than 350 customers already signed up for the $200,000 suborbital ticket), but acknowledged the potential of using the same capabilities for science - the same minutes of weightlessness that will produce fun and excitement for all (at least most) ages will also enable a solid platform for experiments. Interestingly, the first flights are still about two years away, as they were in 2006 ("Virgin Galactic expects to start taking $200,000-a-ride passengers into space in 2008") and 2007 ("We hope to launch the first trip to space in 2009"). To be fair, SpaceShipTwo was unveiled on December 7, 2009, carried by its' mothership, Eve, and it is closer than ever to fly the first non-billionaire tourists as well as scientific payloads. In contrast to Virgin Galactic outspoken nature, Gary Lai of Jeff Bezos' (Amazon CEO) Blue Origin, self proclaimed the company as "famous for being quiet" until actual milestones are reached, gave some details about the company and its focus, in what is the first public presentation by a company employee. Blue Origin has two locations - Kent, Washington and Culberson County, Texas, where launches are performed. Gary Lai also added a few details about the New Shepard system composed of the propulsion module and crew capsule, which has its own propulsion in case a problem arises. New Shepard will be able to carry at least three people to an altitude of about 325,000ft. An actual picture of New Shepard or even its design wasn't shown, and Gary noted that New Shepard won't necessarily look like the Goddard, a prototype built by Blue Origin whose picture is public. Out of NASA came not so much of a vehicle but a program called External Payload Carrier (XPC). Charles (Chuck) Tatro of NASA Kennedy Space Center described it as an attachment to the Atlas rocket which has similar aerodynamic characteristics to a solid rocket booster (SRB). At almost any time until the first stage separation a payload of up to 5000lbs can be deployed. This is not a human capable design but one that could allow experiments taking a ride on another mission. 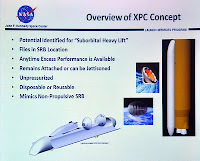 As stated by Chuck, XPC is not really direct competition to the other vendors, as the frequency of flights is much lower (dependant on the Atlas launch) as opposed to several times a day for most commercial vehicles, but the payload size is bigger than both sounding rockets and suborbital providers. Having a Falcon 9 rocket almost ready for its maiden flight in SLC-40 in Cape Canaveral and the closest commercial space vendor to fly astronauts or at least cargo to the International Space Station, SpaceX, Elon Musk's company, was also present. Max Vozoff, Director of Civil Business Development at SpaceX said he felt like "a bit of an impostor", as his company focuses primarily on orbital, but joked about how the first three flights of Falcon 1 were suborbital. He showed DragonLab, a big capsule which NASA currently intends to use as a truck to the ISS, but is being openly developed as a man-rated capsule (it has windows, which don't benefit cargo that much, for example) with the hope to be used in the future for bringing astronauts to the ISS. 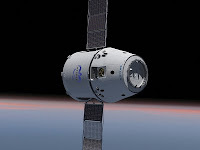 Dragon can also used as a free flying vehicle for experiments in orbit. Jeff Greason, the president of XCOR presented the Lynx, which will be the third manned rocket-propelled aircraft the company developed, following EZ-Rocket (2001) and X-Racer (2008). Lynx is a two-seater craft with a rocket engine that unlike others, can be throttled down and will get a few short test-firings before taking off. It will take-off horizontally and switch to vertical shortly after taking off. Three minutes of micro-gravity will benefit both space tourists (at a bargain $95,000 at this point) and researchers. Multiple configurations are planned for scientific payloads, and it seems XCOR is aiming at both space tourism and the scientific community with the same poise, unlike Virgin Galactic who initially aimed squarely at the space tourism market and is now entertaining the idea of catering for the scientific market as well. The last vehicle related presentation was of Michael (Mike) Mealling of Masten Space Systems. Founded by David Masten (with which I shared a table at the press conference that day) Masten flies only cargo, not people. Currently suborbital, Mike suggested they may go orbital and even take people later on. According to Mike, Masten doesn't have a shell for their vehicle yet, which is their current focus. Masten notably won the 2009 Northrop Grumman Lunar Lander X PRIZE Challenge, demonstrating how a very small team can come up with great working technology, albeit with odd names (Xoie, Xombie, Xogdor...). There are other potential players that didn't present in the conference such as Armadillo Aerospace, but the picture is clear - (suborbital) space tourism and research are rapidly evolving and over the next few years will become a hot arena for innovation and competition. I really enjoyed the presentations, especially the atmosphere of collaboration and lack of even subtle dissing of everyone else - Vendors tended to focus on their capabilities and contribution to suborbital research rather than trying to push others aside, which was commendable. The answer for a related question about payload standardization I asked at the press conference that day validated this as well. Since public outreach was one of the themes of the conference, the question of which one looks the coolest comes to mind. The winner is naturally SpaceShipTwo. Partially thanks to belonging to a well oiled company, especially when it comes to public relations, and partially due to it actually being amazingly slick, SpaceShipTwo (a.k.a. VSS Enterprise) just oozes public appeal, as seen in this video. An honorable mention goes to XCOR Lynx - it definitely looks slick and has a very short planned recycle time of two hours. Watch this video to see for yourselves. Excellent and useful summary. Thank you for taking the time to write it.